We could all just wait a few days to see what Apple’s latest installment of the iPad will look like, but what’s the fun in that? A Chinese blog, M.I.C. Gadget, has gone all out to figure out what this device will look like. They managed to scrounge up parts from various suppliers in order to assemble the shell of the device. Overall the iPad 3 looks pretty much the same as the iPad 2, except for the fact that the iPad 3 is a bit thicker with more tapered edges and has a larger opening for the camera lens. We’ve heard everything from soup to nuts are far as rumors about this thing, but at one time there was rumor that the front glass would no longer have the famous physical home button. If these are the official parts, you can consider that rumor debunked, because M.I.C. Gadget’s iPad has a home button. So here it is. Check out the video below. If this is, in fact, what the iPad 3 looks like, is it everything you thought it would be or were you expecting something different? iPad is for the rich or people pretending to rich using their credit card to buy 1 hottest item that cost Apple about $200 to build and sell for $500 to $700. actually if you bothered to look it up (which u didnt), you would have found it costs 326.60 according to issupply… this doesnt include shipping, retail, marketing, and r&d… maybe some people want to show off their ipads, but most people use it for honest productivity and consumption..
iSupply? An earlier article on Phonearena showed it took $30 to build an iPhone...an iPad is practically just an iPhone but in a larger shell with a larger screen (Which shouldn't even alot cost more than the 4S's "Retina" display) and battery. In fact, the Wifi version would be even cheaper considering it doesn't have the 3G and phone components the iPhone has. And if people actually wanted to use it for "honest productivity", they wouldn't waste their time with an iPad which uses iTunes for even the most basic file transfers. Some people are lame I've own the ipad1 and ipad2 and soon ipad3 and yes I'm middle class but rich in heart. If you feel poor don't buy the iPad buy a knock of android. that song made me wanna dance for some reason. Haha, the sad part? That's probably what Apple does for R&D for the iPad 3 and iPhone 4S. 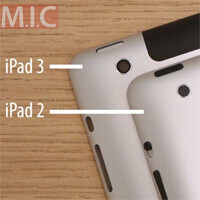 was it ever a mystery what the ipad 3 would look like?